the Big World Blog: What is Fon? In the UK when searching for A wifi connection I have frequently found a very strong BT Fon wifi service and wondered what it was. Fon (pronounced FONE) is a wifi sharing system allowing members to log on to its wifi signal whenever and wherever they are in range. By allowing your personal wifi to share part of its bandwidth with other users while still keeping the part of it private and secure, Fon allows you access to other shared wifi signals all around the world. FON is the name of the owners of the service, so where you see another name with it e.g. BT Fon you are seeing one of the FON partners, BT does not own FON it partners with them. To make it work and access the service you have three choices. You can either buy an access pass allowing you to access the service by time until your credit runs out. You can gain access for free by using a partner site these include Netia, belgacom, BT, E plus, MTS, Oi, SFR, Softbank and Zon. Partners often provide routers and broadband units with the fontera software already built in. If you are with one of these partners you are probably already a member and it’s worth signing up to the service if you want to gain the free mobile wifi. The third way is to buy a Fonera simpl which is a device that plugs into your existing router and splits the signal for you, allowing access to the service. The current cost of the fonera simpl is about £38 GBP if you are located in the UK. This is a one off payment and provides you with the signal splitter box for your personal wifi. FON wifi is available throughout the world wherever you have access to a shared Fon wifi signal. So far The signal coverage is far from even as the map of European Fon wifi spots shows, but if you reside in the UK or Belgium it’s probably worth checking out. If you have enough coverage then your wifi enabled device can act to make free phone calls, and use wifi GPS maps as well as having instant internet access. Fon (Fon Wireless Ltd.) is a company that operates a system of dual access wireless networks. 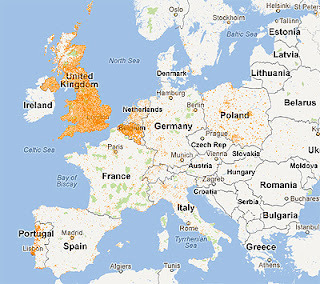 Fon claim to have the largest Wi-Fi network in the world, with over five million hotspots. Members, whom the company calls "Foneros", agree to share a part of their bandwidth as a Wi-Fi signal, so that they can connect to other members' hotspots. branch offices in the USA, UK, Brazil, France, Germany, Italy and Japan. I am not affiliated with FON in any way other than having just signed up for the service. 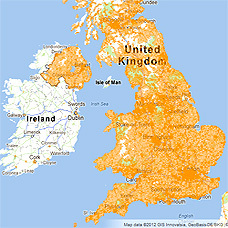 The idea of national wifi coverage is appealing although I’m not sure how other mobile operators will react if it becomes popular. I would be interested to know other peoples opinions of it. Does it cut out a lot on connection? What’s the coverage really like? Is it the future of roaming wifi or just a gimmick? For example you can usually get free wifi in Mc Donald’s, Weather spoons Burger King etc.